This Car pack requires RV 1.2 or RVGL!!!! - 4 paintjobs (Olive Green, Blue, Race, Ratrod) - Special Thanks to thatmotorfreak for the Race paint! The AM-Bio Sparrow is a concept car designed in 1959. This car was made in the hand-made days of AM-Bio. Sadly, only 2 of these machines were made. The idea behind the sparrow was abandoned after 1962 for the more modern and powerful Forster design, which in later years (1973-1979) of its production used concepts from the Sparrow. The original (green) AM-Bio sparrow was fitted with a small block V8 producing an honest 185 HP. However, this concept did not last long, as	during it's test run on the track the motor caught fire. This was due to the fact that the gas lines were too small in diameter to accomodate the V8 engine. The car was then scrapped and the 2nd Sparrow created (dark blue), being completed in 1962. It was given bigger gas lines and registered its top speed at 130 MPH. This car is now held in the AM-Bio museum for public viewing. The AM-Bio Sparrow Racing was never realized, but this is what the result would be if it had been! The rack and pinion steering has been tightened down for better responsiveness, weight has been reduced, the front springs have been fitted with coil-overs, the rear leaf-springs have been fitted with a lowering block for more stability, and camber has been added to all wheels for added grip. 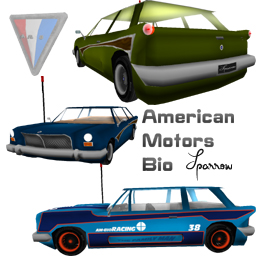 AM-Bio: Don't let the car drive you... You drive the car!